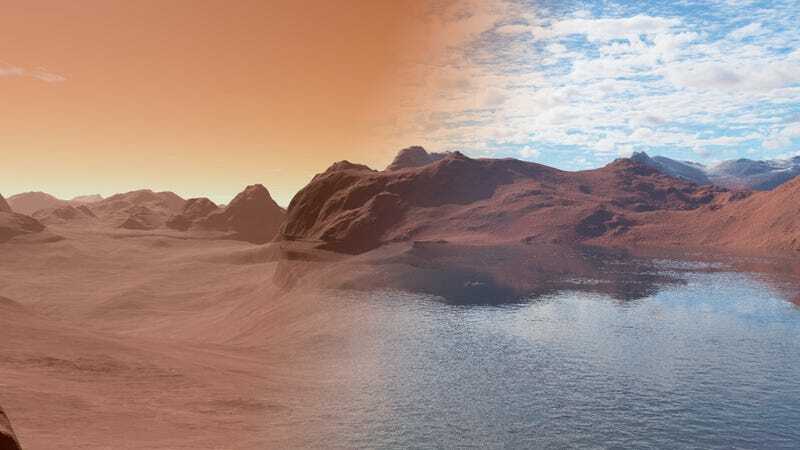 Mars looks like it used to have water—perhaps even entire oceans. But not today. Today, scientists can’t even decide whether it’s got slight trickles darkening the dirt on its mountainsides. If Mars did once have oceans, then where did they go? One international team of researchers think they’ve found answer, based on a new model: The water is inside the Martian mantle. It’s not the only explanation for the disappearing oceans, but the particular geology and chemistry of Mars suggests that, in its early years, the planet sucked up way more water than Earth did. The group began by creating analytical models, based on data from sources including the Martian rovers. That required calculating the details of each planet’s mantle temperatures and pressures and estimating their early rock compositions, among other factors. Playing each model forward in time revealed that Mars’ smaller size and its increased level of iron would send way more water into its mantle. Earth’s more buoyant crust and steeper increase in temperatures at increasing depth in its early history could have further prevented water from reacting with the mantle. The researchers published their results today in the journal Nature. This is just a model, and all models have their limitations. It could be improved with more data. “But everyone can agree that Mars had water in the past,” said Wade. Where that water went will continue to be the subject of debate. Wade told Gizmodo he was especially interested in what his results mean for Earth’s future. The total amount of water on Earth hasn’t seemed to change in recent history. But there’s still iron in our mantle, and slabs of rock sliding into it. Maybe we will lose all of our water one day, although Wade thinks the planet will be fried by the Sun first.